Some of the hardest pictures to photograph at a wedding are dancing pictures. You might not normally think this would be the case. The dance floor is for often times crowded with people turn towards each other so they can look at each other as they dance. Without being intrusive it’s hard to photograph these people. Often new photographers make the mistake of just photographing the backs of the heads of the guest. In sports photography there is a rule that each picture must show a face and the ball. With photographing dancing guest at a reception the rule would almost be the same that it’s most important to show the face of the dancer. The dancer’s face should show the emotion and excitement of the reception. 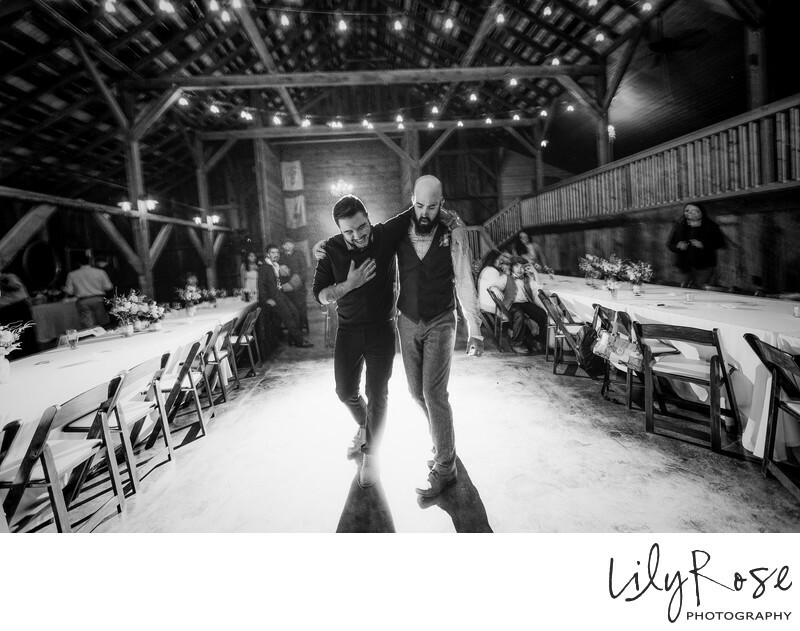 This would be the first and the most important aspect of photographing the dancing at the reception. Second to showing the face of the dancers might be showing their interaction with each other. Capturing genuine moments when people are engaged with each other make for great pictures. After my two guidelines for photographing guest dancing at a reception I would then suggest that a photographer know how to properly balance the ambient light of the reception hall with their camera’s flash. This would ensure that your background isn’t too dark and can show details of the reception hall. A good start for balancing flash with ambient light is what I call the 40,40 rule. What I mean by the 40,40 rule is using a shutter speed of 1/40 of the second combined with an aperture of F4. Typically I would use also choose an ISO of 800. This is usually a good place to start when balancing flash with ambient light. Finally I would suggest that a photographer learn how to take their flash off camera to create a more natural looking light on their subjects. The image shown above is an example of how a photograph can use these four guidelines to create a fun and engaging image. Notice that the dancers faces are shown, there’s interaction between the two dancers and that the light has been taken off-camera and balanced with the ambient light of the reception hall. Have fun and experiment and I’m sure you’ll be pleased with your results. Location: 1051 Walker Rd Petaluma, California 94952.